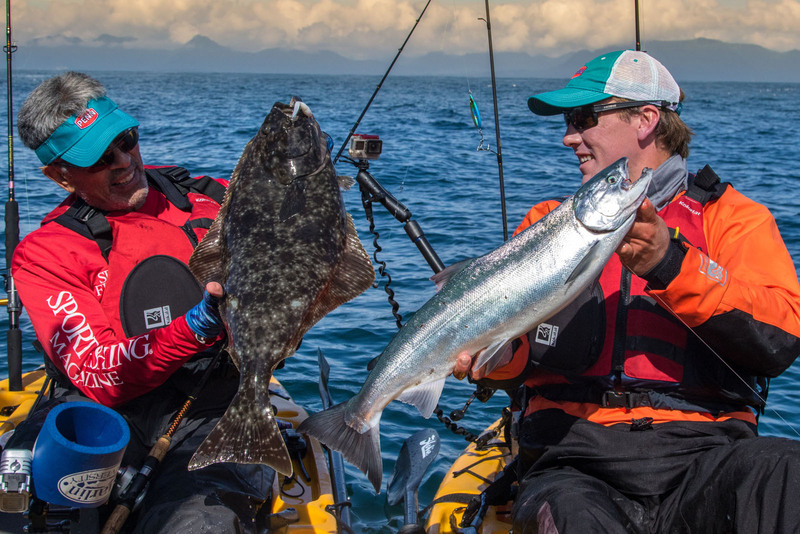 Why are we so excited about remote Kayak fishing in Seward Alaska? It’s more fun to find and catch fish by yourself! We are the only company to offer remote Kayak fishing expeditions in Alaska. We have joined forces with the premier kayak fishing companies in the world to make sure we have the finest gear and tackle. We invited the crew from Hobie Kayaks and Kokatat outdoor equipment to come up and test their equipment before offering these trips. As a result of this collaboration we now offer fully outfitted Hobie Outback Kayaks and Gore-Tex paddling suits custom outfitted for our conditions. We have set these little fishing machines up with the very best equipment: Lowrance GPS Chart plotter/ Fish Finders, Kokatat dry paddling suits and Personal Flotation Devices. We provide all the safety gear and tackle you need for each day. We provide transportation from Seward to the Remote lodge and then each day to productive fishing areas. We offer the ultimate flexibility to taylor the trip to your exact desire. The length of your trip is up to your group, two, three or fours days or more at the remote lodge. The Gray Light and crew are your support vessel for the trip. Our boat will be near by at all times. The crew can take your fish and store them on ice for you, provide a dry warm spot to take a break, or we can bring you tackle, cold drinks and lunch when you are ready. If the weather picks up or the fishing slows down, we pick up the kayaks and fishermen and move on to another location. If you get tired of kayak fishing, we can stow the boats and fish from the Gray Light or spend a day traveling to see some remote wilderness that few ever get to experience. Don’t want to do that much fishing? Captain Andy spent more time exploring the waters of Western Prince William Sound over the last twenty years than anyone we know. He can take you to our favorite kayaking locations, remote Glaciers, Rivers full of Salmon, narrow channels that are seldom traveled and always have lots or marine mammals. Fishing or Sightseeing, these Kayaks let you be in control of your days. We are there to help you as much or as little as you like. Read about the kayak fishing adventure that Sport Fishing Magazine had with Gray Light. Please contact our office to discuss the logistics of these trips. We are offering them to private groups of up to four kayakers. Lodging is in private cabins and meals are do it yourself. We can provide a suggested food list and a cooler with ice for perishables. There is a very well equipped supermarket in town. One final disclaimer – We will only be offering these trips to people that have prior experience with Sea Kayaking. We will not take you if you are not in good health and you need to know how to swim. It requires basic coordination and balance to get into and out of the kayaks. If you have limited or no experience kayaking, there are local guides who can take you out in calm water and provide a day of training prior to the trip. We also book through the Crackerjack Charters office in the Seward small boat harbor.